This room has one double bed, WIFI, cable, and air conditioning. ABSTRACTION 105-A Fine Art Prints, Canvas & Framed Wall Art at Imagekind.com. We have a newly remolded room at Hotel Casa De La Luz/Casa De Huespedes in Tlacotalpan, Veracruz. With pending rentals in a week, we had a crew come in and work from 7am to /7pm for 5 days. And believe it or not…we completed the task on time! No small feat here in Mexico. Hotel Casa De La Luz in Tlacotalpan, Veracruz is a charming “GUEST HOUSE” with an apartment, and 2 rooms to rent by the day, week, or month. Hotel Casa De La Luz is filled with original paintings, photographs, wonderful pottery and a vibrant representation of the ARTESANIA ( folk arts and crafts ) of Mexico. The brilliant paint colors used in Hotel Casa De La Luz are a rich visual complement to the lush tropical garden. In this garden there are always a wide verity of plants and orchids in bloom year round. Also you may click on these link dates on the right side of the page to read in more detail about Hotel Casa De La Luz, and the UNESCO World Heritage Site of TLACOTALPAN, VERACRUZ MEXICO. Thank you for taking the time to read more about Casa De La Luz, and Tlacotalpan, Veracruz. Click on the below listed link dates at the right of this page to read in more detail about Hotel Casa De La Luz and Tlacotalpan. CLICK ON : April 2009–January 2009–July, August, and September 2008. I (billdelaluz) have hooked up with ZAZZLE.COM and have started printing “T” shirts, and other products, using many of my photographs. These items are all available on the zazzle.com.billdelaluz/ web site. In most cases, you can customize any product any way you like. Its simple and fun. Hope you have enjoyed this posting and I look forward to posting more items in the near future. 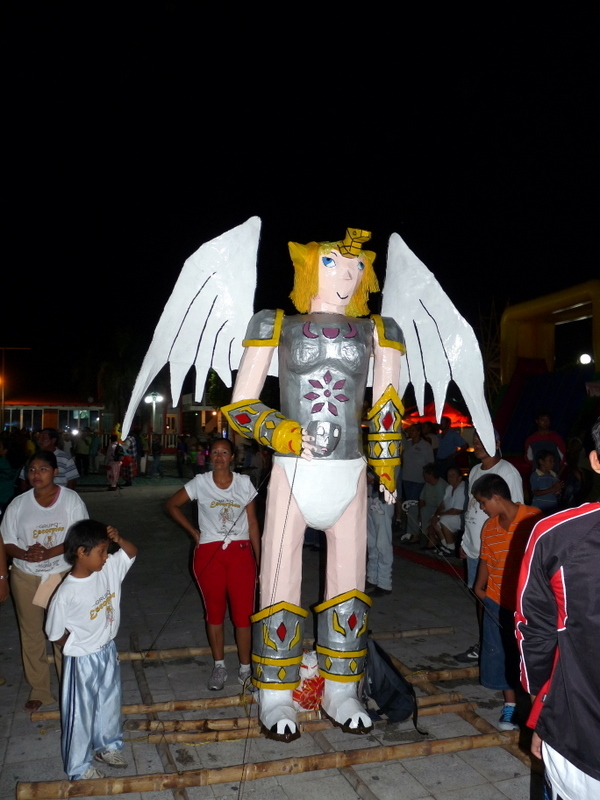 The Parade of GIANTS in Saltabarranca, Veracruz is a tradition started in the late 1800s and continues to this day on the 14TH of May every year. Many towns in the state of Veracruz have the tradition of the MOJIGANGA — As I posted earlier in this BLOG — but none can surpass the shear size of the entries nor the full support of this entire community as seen in Saltabarranca. These giant figures require from 8 to 30 people to carry them, and manipulate the different mechanical and electrical parts. And several months to construct. The MOJIGANGA GIGANTES DE SALTABARRANCA is well worth the late hour . ( it starts at around 10:30 PM) with a Mojiganga for and with the NIÑOS starting at 8PM…The thousands and thousands of people that throng from all over the state of VERACRUZ, and beyond , come to enjoy the festivities, see…and be seen…and party till dawn with live music and fireworks …and , of course..CERVASA ! The MOJIGANGA-PARADE OF GIANTS ends around 1 AM. Here are some photos of the fantastic, animated figures. I hope you enjoy them ! Be sure to include a side trip to TLACOTALPAN on your next trip to Veracruz, and the MOJIGANGA De SALTABARRANCA ! CASA DE LA LUZ-MEXICO / CASA DE HUESPEDES IS FOR SALE.